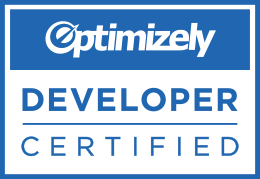 Convincify is an Optimizely solutions partner - both developer and platform certified. Our team of conversion optimization experts can help you plan, execute, and analyze Optimizely tests. For years, we’ve helped companies run tests with the Optimizely platform – from the smallest design changes to complete checkout process overhauls. Fortune 100 companies and early-stage startups have trusted us to run their optimization and testing programs. Whether you need help getting up and running with Optimizely or you need to get a complex test coded and launched, we can help. 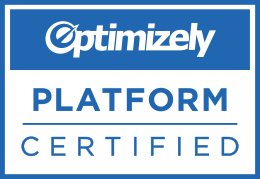 Our team has been tested and demonstrated a thorough understanding of the Optimizely platform. We know all the ins-and-outs about test creation, goal setup, technical test code, Enterprise features, and more. Not only does our team know the platform, our developers have demonstrated they have the technical skills to create advanced tests. They also understand how Optimizely technically works, so that we’re confident in our tests and the results. When it comes to running tests in Optimizely, we’ve done it all. We have years of testing experience and we’ve run hundreds of tests. Experience is important when you’re looking for a conversion optimization agency. Not only can you take advantage of our knowledge of what works and what doesn’t, but because we’ve done this before, we can move quickly. We can work with you to create an optimization strategy which will lead to higher-performance in key business KPIs. We consider the full business stack to develop optimization strategies which work well with all digital aspects of an organization. Securing resources for marketing initiatives is a common struggle for many businesses, but our designers and developers make high-performing pages a reality. What good are the best conversion optimization strategies if you cannot design and execute them? We’re specifically skilled in designing and developing tests quickly in the Optimizely platform. Ready to start working with us? We're always looking to partner with companies that recognize the importance of testing and optimization.